Local dahlia societies and clubs within the ADS have a role to play in celebrating the 2019 Year of the Dahlia. 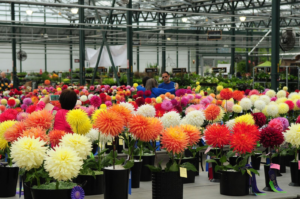 If your organization has a working relationship with a local garden center or nursery, talk to the managers or owners about the 2019 Year of the Dahlia. You can offer to give presentations both on growing dahlias (spring time) and digging and dividing (fall). 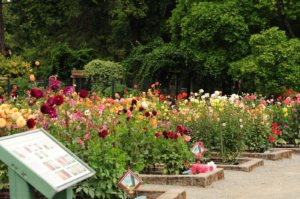 Also, a summer time dahlia exhibition or show at a local nursery or garden is an opportunity to introduce the public to the dahlia in its many forms, sizes and colors. A flyer titled “Discover the Joy of Growing Dahlias with the American Dahlia Society (ADS) is now available for downloading from this website. It is a great handout to use at dahlia related events. There are two version of the flyer – one with just the ADS name on it and one that is a fill-able form (members only), so you can add your organization’s name and its website page prior to printing copies. In addition, there are Year of the Dahlia promotional materials, prepared by the NGB, that can be downloaded from their website at https://ngb.org. The NGB has a newsletter that will keep you abreast of what they are doing to celebrate 2019 Year of the Dahlia. ADS members can sign up for the NGB e-newsletter by going to their website.